In the past, I have recommended two purple leaf beech trees for residential gardens. I have already covered the purple fountain beech. Now, I will cover the Tri-color beech, but with a caveat at the end of this post that may be changing my recommendation. The Tri-color beech grows shaped more like a regular beech than the Purple Fountain beech, only smaller. It has a rounded outline and if not pruned will grow branches from the ground up. These look a lot more like a normal shaped tree than the Purple Fountain beech. Tricolor beech in spring at my previous home with bearded iris in bloom. It is not its shape that draws attention, but instead its unique leaf color. It has a purple leaf with variegation that has pale rose color. Hence its name as ’Roseomarginata’. 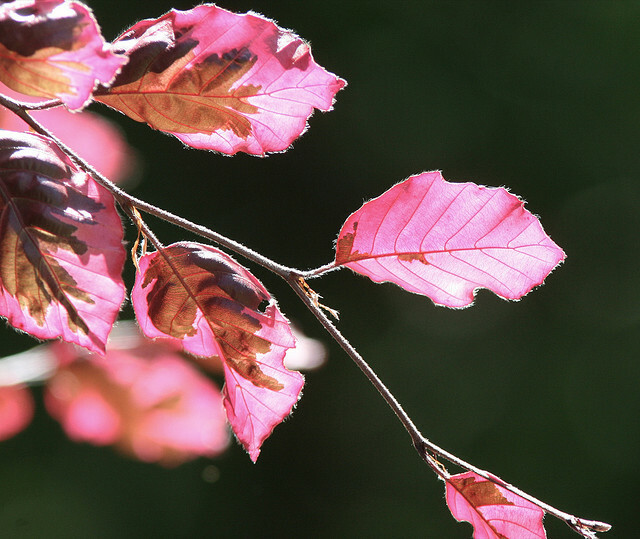 The overall effect of the two color leaf is what appears to be a purplish pink tree. The tree looks terrific when back lit by the rising or setting sun. It works great as a tree next to a patio. In fact, the first one I ever saw that really wowed me was one at Rich’s Fox Willow Pines in Woodstock that was sitting next to a patio. It was probably about 20 feet tall and was a fabulous tree to sit next to and just stare at it. I believe Rich donated it to a botanic garden or sold it, so it is no longer there. The size of the Tricolor beech will get to perhaps 30 feet high and 20 feet wide in most locations. It might take two or three decades to get that size. Depending of course upon how big it is when you plant it. The edges of this tree’s leaves will burn in August unless it gets some afternoon shade. Tri-color beech has wonderful fresh late spring early summer purple pink leaf color. The color fades in the sun of the summer and if not shaded the leaf edges will get a little shall we say “crispy”. This does not hurt the tree, but it just looks better if it gets some afternoon shade. It gets a light bronze fall color that is nice. Mine does not tend to hold many leaves in the winter but perhaps a bit less summer sun may improve this. The smooth gray bark gets provides winter interest once the tree gets larger. This tree is for the birds! Exposure: Light shade. Afternoon shade best. Features: Striking purple foliage with irregular pinkish-white and rose borders, Ornamental Bark, Slow Growing. Growth Habit: Upright oval to rounded form. Mulch them with a good bark mulch to retain moisture, but don’t mound it against the trunk. Beeches are best pruned in late winter once the worst of winter has passed. Deer don’t particularly care for beeches and will usually leave it alone. Beech used to have few pest problems unless you in the eastern US near an areas where native beech forests have been decimated by beech bark scale. However, that may be changing. There is another mystery tree disease that is rapidly spreading across the native range of the beech and may prove a problem for beech trees across the country. It also seems to impact all species of beech trees. Scientists say the disease, known as Beech Leaf Disease, has been found in Ohio and Pennsylvania, and Ontario, Canada. The first symptoms are a dark staining pattern on the leaves, then the leaves become shriveled and leathery textured. Then the tree dies. Studies have shown no signs of insects or the presence of other disease vectors, adding to the mystery of how it is spreading. The cause of the tree killer is unknown. Until it is figured out what is causing this disease there is no way to know if its spread can be halted. If you are in an area where there are beech trees naturally or heavily planted as ornamentals even, I would recommend not investing too much money into planting any beech tree. If you already have one, appreciate it, stay informed and hope for the best. If you are not in Ohio or nearby states I would still recommend them but I would plant a smaller less expensive tree as Tri-color beech can be a rather pricy and it may not have a long life. For more information on Beech Leaf Disease see this article. I previously posted this article in 2013 but have rewritten it to include information on Beech Leaf Disease. We have a beautiful tri-colored beech that we planted last year. We have been excitedly watching the leaf buds form until today when we found the trunk and several branches covered in a light, off-white powder. I’m not sure if this is scale or some other issue. Do you know if this is a common problem in upstate NY, and do you have any suggestions on how to take care of the issue? Thanks for any help you can offer. Patty, I hate to be the bearer of bad news, but from your description is does sound like it could be the scale that starts the disease. New York state is definitely infested, so I would assume it is the case or at least probable. The good news is unless it is already pretty far gone, you can kill those suckers! You also can use some very safe chemicals to do it. No need for the nasty stuff we have to use to kill some bugs. A highly refined summer Horticultural oil and insecticidal soap may both be used to kill the scale and should be applied when the immature form of scale — crawlers — are present. Of course the bad news is you will have to at least be on the lookout and perhaps treat the scale every year. Heck, according to Michigan State (See below) you can even scrub them off. That sounds kind of gratifying, like picking off Japanese Beetles from my peach tree and dropping them into a bucket of soapy water. I would probably contact your local extension office or the Plant clinic at the closest arboretum or botanic garden and see if they can give your any further advice as far as chemicals to use or timing of the application. Thanks for the speedy reply. We followed your advice and checked with a nearby source. They recommended using a specific soap and brush. After a good scrubbing we are hopeful that our tree will survive. Of course we plan on making this an annual event if necessary. We greatly appreciate your help! Patty, glad I could be of help. Great post 🙂 I’m in love with this tree! I’d like to plant one in our front landscaping but I read it has fiborous roots so other plants can’t grow “under” it…I’m a gardening newbie…is this true? We would only have a few small plants near it (hostas, lilys, coral bells, etc.) so in my total unexpert opinion it seems ok…thoughts? Oh also, I’m in Michigan and it would only have morning shade…thats ok, but not ideal I gather? Thanks for any insights you can share!! Hi Mindy, Beech trees do have shallow roots, but I think if your plants are existing they will do fine. It is harder to plant under an established Tricolor beech, but if you are just planting the tree your existing plants will do fine. If the lilies are close to the trunk of the tree they will eventually have a problem. These trees do prefer afternoon shade in the hot summer months. It will survive (mine is in full sun in Chicago area), but the leaves will look pretty rough at the end of summer. A nice layer of much and regular watering will help them. If you have another spot with some shade in afternoon that would be a better spot, but in Michigan you should be OK in your spot. I am on my second tri-color beech. It’s in full sun, but I water it daily. The leaves are looking droopy and I am not sure what else to do, so I am looking for help! Don’t water it daily. Even in high heat thats too much. A long deep watering one or twice a week should be sufficient. If its over a hundred maybe three times a week. If you soil is sand then maybe every other day only during extreme heat. Natures funny in that the symptoms of overwatering look a lot like underwatering. I think your leaves are dropping due to excess moisture. Let the soil dry out between waterings. Make sure you give it a long deep watering when you do water it. What constitutes a “good, long watering”? It depends how much water you have coming on. A soaker hose around the tree on for 1-2 hours would certainly qualify. Hi Jim, I was wondering if a tri-colour Beech would do in Ontario, Canada just north of Toronto Zone 4b? Have a sheltered in back yard with a morning sun afternoon shade area I was thinking of planting one. They sell them locally here but there’s confliting information with regards to there hardiness. Any thoughts? European beechs are typically hardy to zone 4, so I think it will be fine although slow growing. Your tree is probably too close and will probably cause problems eventually. You could trench close to your house and protect your foundation using some copper coated materials. But at 5 feet it is really too close for this to be a long term solution as the tree will grow into the house. Ten or 12 feet away, that might work, but 5 is really close. The tree probably can be moved. IF you can hire a tree spade and they can get ACCESS to the tree. The good news I don’t think you are in an urgent time frame here. What you will want to do is have the tree root pruned inside the diameter of the the tree spade. Do this a year before the tree is to be moved. This will give the tree a chance to grow feeder roots closer to the trunk which will aid in it’s survival. If you can find a tree care company that knows what they are doing, you can move this tree. I would Google “tree moving” and maybe even look in the yellow pages to see who is in your area. Call them, describe what you have and see if they can give you an idea of what they would charge. Definitely contact at least 3 companies if you have that many in your area, as the prices they charge and their means of moving the tree may vary widely. Thanks you very much for this info! I measured it last night and it is a little farther away from the house than I thought – closer to 8 feet. I’ll look into some local companies and go from there. They most definitely can be pruned to stay smaller. European beeches are often used as hedges in England, so they do take pruning well. Making them look natural while keeping them small does take some skill and practice. If you keep the tree small, I would not worry about it’s roots getting too aggressive. They are not like willows. If you are willing to be dedicated to pruning it you can definitely keep it smaller, that is a big part of what we do at Japanese gardens as pruners. there is also a tri color columnar variety, any info? was thinking of planting one in the fall if I can find one . I was not aware of that. You may want to try Rich’s Foxwillow Pines (www.richsfoxwillowpines.com) if you are anywhere near Northern Illinois. They do have premium prices, but have an incredible variety of plants and are good people too. We have what I believe to be a tricolor beech on our property in CT but it seems to be struggling. The branches have leaves on the ends but the center is sparse and appear to be wrapped in places with what looks like lichen. This lichen prevented many of the leaves from opening this spring. A greenhouse did indeed diagnose it as lichen but said it was not harmful to the tree. They also recommended that I try feeding the tree in hopes it will push through this tough ‘phase’. Does this seem accurate to you? Mine also has a fair amount of lichen on it and yes it is harmless. See the comment above and my response regarding beech bark scale to make sure you don’t have that as it is a serious pest of beech that may or may not be common in your area. Last year in much of the US, Tricolor beech probably had a rough time with the excessive summer heat and drought. You may be seeing symptoms of this if it was similar in your area last summer. I am wondering if you have any good recommendations as to what perennials might do well and look showy in front of the tri colored beech. Hmmm, They have some real strong visual energy so I think you would want something that was mellow. I think I would go with something with green foliage and a flower than was pale or white perhaps, no oranges or yellow as I would think that they would clash. I actually have a green with white variegated Hosta by mine that looks nice. The variegation echoes the Tricolor but is still pretty mellow as it is white and green. Nothing with colored foliage as I think that would be too much. The beech does have shallow roots and casts a dense shade, so consider that depending upon on how close the perennials will be to it. Pachysandra both Japanese and Allegheny spurge may be good choices for a ground cover under it. Anybody else have any ideas out there? I have put grey/silver plants with my purple beeches and it is stunning: lambs ears, dusty miller and artemisia. Chartreuse plants work well too. Don’t water daily. Your tree may need to be kept moist, but not wet. Let it dry out between watering. I would say water it one to two times per week. If it is really hot out (say 90’s) maybe water every two to three days. Keep watering when fall comes, but drop frequency down to once a week or longer. I have not seen your tree, but I would usually remove the twine and cut the burlap down about 1/3rd of the way down the rootball if I didn’t take more of it off. Is it all purple leaf? I have heard and seen a branch or two do this for a year, but never a whole tree. I have to plead ignorance on this, I will look into it and see if anybody can give me an answer on this. How much sun does the tree get? I checked with Rich’s to see if they had any ideas. They said they saw some of their trees have little varigation last year and speculated that your trees issue may be related to heat and drought from last year. I am not sure where you are located but drought being a factor sounds like it might make sense. I think your tree will probably leaf out normally next year, although it may be a couple of years if it is drought induced. I am really speculating here though. I have a young Tri-Color that was planted very late June, lower Michigan. It was doing beautifully for a few weeks, it seemed. After seeing other posts, though, I think I may have watered it too much, even though we had a scorching heat spell for a few weeks following its planting. In a very short span of time the leaves have browned and curled, but do not feel dry nor have fallen off. The heat spell passed, and I backed off on the watering, though we have had many cool rainy days. The branches are not dry, but I do notice variegation on the little branches that depart off the trunk (a gray variegation). I am so sad if this pretty little tree is dying, but something makes me hope maybe it will recover from shock? It does get morning and afternoon sun but has very(!) large pines planted to its southwest of it to shield it from later afternoon sun. Any thoughts? Keep watering it if needed and hope for best. Next year if it does not leaf out right away give it a few more weeks. They do leaf out late spring too. Not past any warranty.you have though! I have a beautiful Tri-Color Beech that i am crazy about. So many people out walking have stopped to ask what type of tree it was. The branches are down really low and in the way when mowing. I was reading your advice on pruning how far up can you prune? I do not want to harm my tree. It depends on how big the tree is. You can limb it up a bit, but beech branches do tend to droop. I would consider extending a mulched bed under the tree to eliminate mowing under it. I really want to get a tri-color beech for me front yard, but I have the deer issue. Should I be concerned about the deer eating the leaves if I get one? I haven’t had them eating leaves off of my other trees, but I’m wondering if perhaps this one is tastier to them. Thanks! They are considered moderately susceptible to deer damage. They are not their favorite food, but will eat if hungry enough. They are usually not severely damaged. The deer ate mine, so we trimmed it up, it looks like a tree and the deer leave it alone now. We have a tri coloured beech that was planted last fall. It gets great afternoon shade. I noticed when it leafed out that the leader did not get any leaves. Also it has lichen on it. This week one day it had leaves and the next day they were gone. Something ate them in a day (or night) like a swarm of locusts had come through. What was it and what can we do about it? We are still in our warranty period. Boy I am not sure what’s going on with your tree. Did the leaves drop or are their still parts attached to the tree with most of the leaf eaten off. It could be early leaf drop due to stress, but it could be worse. I would definitely contact the nursery to see what they say. Tell them you think it may have died and at least they can be on noticed and maybe they will extend your warranty till next year instead of them having to replace the tree this year. I am pretty sure they were eaten as there were no leaves around the tree as you would expect from leaf drop. It was planted last fall and leafed out beautifully this spring and then as I said last week overnight it looked like a swarm of locusts went through and not a leaf left. Well the good news it is late enough in the season that those leaves probably produced enough sugars for the tree so that it will survive this defoliation. I have a tri-colored beech that is about 5-6 years old. I just noticed the ends of the leaves are turning brown, we live in Ohio and we did have a rather cool August. I am wondering if this is normal or should I be worried about a disease? If I am understanding you right, That sounds like a normal late summer, too much sun symptom. Mine does the same thing. Is it the pink part that is turning brown and are they dry? Another question, at the same time we bought the tri colour beech we also bought a Mountain Ash and it is looking very sorry for itself. Not many leaves, some of the branches never did get leaves, do you think it is a goner? It is hard when you have trees delivered and planted in Nov as they have no leaves. The other species we had planted are doing really well. Probably. We plant mountain ash to feed insects and not much else around here. If your climate is colder, they may do better for you. I just purchased a Tricoloured beech on the advice of a nurseryman. It is now planted on a hillside in sandy loam, wide open to the south and west on the topside of a hill. It will not receive any shade at all. I called the nursery when I read the ticket suggesting that this tree should have afternoon shade and they said as long as I water it it should be fine. I live in Canada in zone 4a -4bbut this tree is exposed to the prevailing west winds. Should I persevere? They gave me a one year warranty but I’m worried that this tree may not withstand the open spaces. 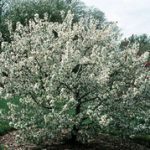 That may be an especially tough site for that tree, but it will probably survive if you are diligent with watering especially the first three years and during droughts. I am sure by late summer it will be look a little rough. We just bought a tri-colored Beech to plant off of our backyard deck (which is 14 feet off the house, but there is a shed that is only 5 feet away from where we will be planting this tree. We also have a waterfall 8 feet away. Is there a way I can keep this tree pruned so that it doesn’t grow too large? Is there a website that will tell me how to prune it so that it doesn’t end up a shrub? I love the leaves and the bark with the lichen, I just can’t have a 20 foot wide tree in this spot. Will this tree work for me do you think or should I return it? (I just bought it and haven’t planted it yet). We live in Northern Nevada (high desert), so we get hot summers and snow in the winter. We’re zone 5-6. How hot and dry are your summers? These beeches certainly like a little shade in the hot afternoons in my area (Chicago) or their leafs will scorch by the end of summer. If you are getting temperatures in excess of the upper 90’s this tree will REQUIRE shade, mulch and attentive watering during the hottest parts of the summer. The winters should not be a problem for it. If these are being sold in your area by local nursery and landscapers, you might as well give it a shot. It is a slow growing tree under best conditions and if it is under stress from heat, it will be even slower. European beeches are often used as hedges so they certainly can tolerate pruning. If you don’t mind the tree eventually engulfing the are around and above your shed, you should be able to remove branches growing directly toward it. Those distances you mentioned will require pruning, but they don’t scare me as being too close. If you need to you can always remove the tree later. If you get twenty years out of it and decide it has outgrown it’s space you are allowed to remove it. My guess is the shed and maybe the waterfall will be gone before the tree. We just got a tri-colored beech and the nursery is coming to install it so I thought I would look into how to maintain it. You mentioned that it has a low root system. We are planting this next to our walkway up to our house as well as it is next to our driveway. Should we be concerned that it is going to damage them both. It is at the corner of where they both meet. Is there a specific distance we should be away from them? Beeches do have shallow root systems. This is a concern with trying to grow plants under established trees but can cause sidewalk issues as the trees get larger. I would try to plant it as far away as possible, but I don’t think it would be a major problem. The main reason is that it is going to be a smaller cultivar of the European Beech. If you were planting a Riversii or another of the ones that get 40-60 feet tall and wide, I think you would have a larger problem with sidewalks. The Tri color will probably be about 30′ tall and 20′ wide when it matures, so you do want to give it room to spread out a bit, but it’s not going to be a monster sized tree. I think it’s root system won’t cause issues with sidewalks if it was at least 10 feet away from them. I have seen a pretty decent sized one planted as a street tree oddly enough and it was probably 5 feet from both the sidewalk and the road and not causing any problems to either. So you could probably go a bit closer then 10 feet if you wanted. I have a tri-color beech tree in my front yard. I planted it about 8 years ago. It has always done really well in it’s location. This year as the leaves opened I noticed the leaves on the top half of the tree are drooping and look dried out. The bottom half looks normal and healthy. Do I have a problem that I can fix?? It does sound like you have a problem that could be a big one. Did you experience a hard frost after the leaves were opening? I would also look at the trunk at the point above which the leaves are showing symptoms, is there any injury or other things that look odd there? Definitely look in the above comments for the one on beech bark scale, if you are in an area that has this problem, this may be something to look for. If it is, there are measures you can take to save your tree. Has there been any odd things happening to the soil such as a water leak from an irrigation system, etc? Any pesticide or fertilizer applications since the leaves have come out? There are a lot of things that it could be, as far as what to do it will depend upon the stress that caused the issue. But in general if you keep it well watered (not too much though, once or twice a week if it is very hot should be enough) during the summer hopefully it can recover. Don’t be in a rush to cut out branches that look dead, there could be dormant buds that open later in the summer if your current leaves fall off. We have a fairly young tri colored beech tree that we planted 2 years ago. This year, although it has lots of leaves, it actually looks like a weeping variety! The leaves are full and show no signs of stress, but all the branches are arching down. At first, we thought that maybe the tree was mislabeled at the nursery, but the leaves are the nice tri color. Any ideas what’s going on with the tree? If it is still a very small tree, it is probably just normal till the branches grow a bit thicker. I don’t know of any weeping form of the tricolor beech. I just bought one and have a couple of questions abou the growth habit. 1) The trunk is somewhat twisted. Will that straighten with age as it thickens up? Or will it always look somewhat crooked. 2) The leader on top (at around 6 feet) forks sharply to the sides. Is it preferable to train one straight or is that the typical growth habit? The trunk won’t straighten out but it will be less noticeable as it thickens. This is not uncommon on beeches and usually adds a bit to their character as they grow. It is preferable to train one of the branches straight to be the leader. And faces east. I have lusted after a tri-colored beech for years and have had no where to place one. I now plan on replacing the soon doomed basswood with this tree….. Does this sound like a viable option, or am I spending too much money ($250.00) on my new specimen? I have seen a Tri Color beech used as a street tree in Rockford, IL. Given your location in an area that does have Beech bark disease and native beech present I think I would consider another tree. There are some other reasons that make it questionable as a street tree. The thin bark is a magnet for vandalism from bored teens walking by and the branches do have a tendency to grow close to the ground. If you really want it, you can always give it a try. If it works out and gets decent sized it will be a show stopper in early summer especially. I personally would go for a tree like the Kentucky Coffee tree which is also native to your area (or just a county or two south of you). Jim, I planted a four foot American Beech last fall in central Michigan. It is near a river and receives some wind protection. The top 3 feet have died I assume due to the harsh winter but the lower branches have leafed out and it is doing okay this summer. I did not prune the dead leader off and am wondering if I should prune it this fall/winter in the hopes that a second leader will develop. Or, since it is a young tree should I just replace it. Or should I prune it and pretend it is a shrub. I would probably cut it off at some point. It won’t impact whether a new leader grows of not, but if you leave a bit of it, you can tie a shoot to it to help use it to train the shoot to be a new leader. Years ago we saw a tri-color beech tree while camping near Cincinnati Ohio. We live south of Nashville TN. Is it possible to grow this tree here? Tri color beeches are typically rated as good for zones 4 thru 7. Nashville and the area around it is a zone 7. I think you will be OK as long as you site it to get afternoon shade and maybe late morning too. Heck maybe almost all day. The heat in the summer will require it to have shade or it’s leaves will fry. You will also need to keep it watered well during exceptionally hot or dry periods in the summer months. Last year in late May early June I planted a tricolor beach at the back of my yard 20 feet from the cistern. In a raised bed about five or 6 inches high. the tree was about 4 1/2 to 5 feet tall I watered it regularly but not too much it was beautiful for about a month and a half till all the leaves started turning brown and by the end of July all the leaves were brown and dry. I went back to the nursery that I purchased it from and they said wait till spring and see what happens. So it is mid April now and I have scratched the bark with my thumbnail and it is brown underneath the bark pretty much everywhere. I am going to take it back and get 50% credit but I would like to purchase another one and try again in a different spot. The spot I have in mind is next to my patio which is cement about 15 to 18 feet from the house also inside of a retaining wall that is about a 3 Quarter Cir. retaining wall at the corner of the patio. So the tree would be planted about 3 feet from the inside of the retaining wall and about 3 feet from the corner of the patio. The old tricolor beach tree that did not make it was in full sun all day raised above a wet area. The retaining wall where I want to plant a new tricolor beach is on the side of my property between my house and my neighbors house where there is a drop off of about 2 1/2 feet hence the retaining wall. Also just to the west of the retaining wall about 20 feet away is a 35 foot river birch tree that should protect it from westerly winds and late afternoon sun. Also my backyard faces south. Do you think this is a good location for a tricolor Beech tree? Its a little tight as far as space. The roots of European beeches are close to the surface and may cause issues to your patio and retaining wall. The tricolors don’t get big quick, do they usually cause less of a problem then other beeches. It will probably be good for a while but may eventually cause issues. These will probably be fixable without losing the tree, but will require some hardscaping work. Whether issues that may crop up a decade or two is enough reason to not plant is only a decision you can make. I personally would probably plant it there and figure if it grows big enough to make me redo the retaining wall, I would be fine with it. Hi Jim – awesome info here. We planted a tricolor beech last September. It had leaves and seemed fine when planted. It’s mid April and leaves have not returned. Should we be worried, or is that normal? We live in Oregon. I planted a sapling trcolored beech last summer and based on your advice, probably watered too often initially and probably not long enough. It is only a couple inches above ground now, any chance this tree will begin growing again from the root? What is the best way to tell if the root/tree is still alive? I am not sure where you are located Stephen, but it is possible that your tree has not leafed out yet just because beech’s are among the last trees to leaf out. Mine is at least several weeks from having leafs. Can I plan a Tri color beech 10 feet from my house? Is it going to be too close to my ranch house which is east facing? If you could get it out to 15 feet it will work better for your site for a lot longer. Ten really is really tight for a tri color beech. It will work for a while, but will eventually get to big and grow into your house. Thanks, Jim. Unfortunately I won’t be able to move out another 5 feet. Will trimming works when it gets bigger? Is Tri color beech an ornamental tree? How big will it get? i planted a 2″ diameter tri color beech last spring in my parkway and it gets full sun. I live in northwest illinois and was thinking of moving it to my backyard around my patio where it will get 6 hrs of sun then shade. Do you think i could move it successfully. Sure if you dig a large enough root ball and don’t break the root ball apart. I think you might be as little late moving it now, early April would be safer. I think beeches are best moved then, so I would probably wait till next year. By then you might decide to leave it where it is. Wow! So glad to find your website. I have a tri colored beech that we planted in the front of our house about 4 years ago. (It’s about 10 feet front the house :0 and I’m reading here that’s not good! Yikes!) . I love it! It’s about 20 feet tall now. Last year I noticed about a handful of dark, not variegated leaves and this year in the same spot there is a whole branch of them. The leaves are also larger. Is it ok to prune them off? Now? Is pruning something that should be done? Also, I just noticed it looks like beetles or something might be eating some of the leaves because I notice that “skeletal” look on some leaves. I have some “Tree & Shrub Protect and Feed” that I used last summer. Do you think that will help against insects eating the leaves? Yep. You should prune off the branch that those leafs are coming off. Prune it back to the trunk. There are cases where in some years the varigation of some leafs won’t be there, but if it’s the same branch a couple of years you can probably cut it off. Yes Bayer tree and shrub care (Merit) should take care of insect problems. Do you think I need to use a topical insecticide too? I dont want to lose the tree. It will take up to a month before the chemical is throughout the tree. If you have aphids you should treat with something like an insecticidal soap or even just hosing them off with water. I live in southern Michigan and am considering planting a multi stem tricolor beech off the corner of a deck in a slightly elevated bed that has a block border. the diameter of the semi circle that it would be planted in is approximately 8 feet plus under the deck, is that enough space for the root system? The other concern I have is I cannot mulch the bed because of a dog that would dig, so I have black lava rock. do you see that being a problem? My tri color beech is about 8 years old. This spring in central Ohio we has several nights after the leaves budded of temperatures in the low forty range. The following week I put in fertilizer spikes. Now the leaves a drooping. Did I fertilize at wrong time or it it heavy spring rains or both? Is there anything I can do to help my favorite tree? I am going to guess it is not the fertilizer spikes as they usually take time to breakdown. Unless you put a whole bunch in. The temperatures should not have bothered it either. Not sure what is going on. I usually recommend no fertilizing or only lightly fertilizing with a slow release fertilizer. They do have shallow roots that can be burned if heavily fertilized. I don’t think your spikes probably did much. Hopefully your tree will open a set of dormant buds to get another set of leaves. I would probably do nothing right now and see how the tree responds in a month. I am not sure. Most European beeches do eventually. The fruit will not be very tasty as it is more bitter then the American beech. Slightly toxic, I doubt your dog would find them tasty enough to eat many. But who knows, maybe your dog is as stupid as mine. Definitely not a thing to worry about as it might take another couple of decades to get nuts (if ever). My tricolored was purchased as a small specimen, but now is around eight years old and probably eight feet tall. My concern is that I have more leaves that are all one color pure than tricolored ones. All the purple leaves started out bigger than the rest but I for some reason thought that they were not mature and that was the reason they had not changed to be tricolored. Oops I should have been clued in earlier. The lowest branches are still tricolored, but the majority is all purple. I have prunedit three or four times to bring the canopy up as it grows. Is there any way to get the tricolored back for the majority of the tree? How? Or do I have to start over? What will happen if I pruned off the only branches left with variation? Thank you for any help you can provide, my local nursery were it was purchased is stumped. If this is the 1st year this happened, I would say relax and see what happens next year. If you cut off all the clonal tree from the rootstock, I would expect you to have green leaves as normal European Beeches are, so I doubt that happened. Some years odd things happen to this tree depending upon weather, etc. I have had mine have purple leaves on a branch one year and the next year it is back to a variegated leaf. So relax, enjoy your mostly purple tree and see what you get next year. Hello – we planted a tri-color beech at the end of last summer. The leaves have returned and it is doing great. But the colors are different than the pictures I’ve seen. The edge of the leaves are a light pink and the center portion of leaves are more green than anything. No purple at all. Is this perhaps a different type of tricolor? Hi Jim – any insight on this one? No prob at all if not. Yes Lance there are a few different clones in the trade that are commonly called tricolor beech. One is just pink margin and purple interior leaf(the more common one seen) and there is one that also has an outer later of white besides the pink and purple. There may very well be others. The amount of sun they get can also impact color. 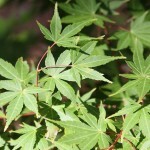 Just like purple leaf Japanese maples, that are greener then purple if grown in the shade. So that could be playing a role also. It is probably just an adaption to stress on the part of the tree. 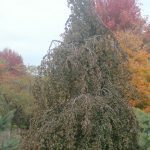 If weather changes or irrigation reduces the stress tree will probably return to normal leaf colors next year. I am not really sure if we have “normal” weather anymore. I just planted a tri color beech tree in a garden surrounding the house about 7 feet from the side of the garage which is attached to the house. I am concerned now that it’s too close after reading how large it gets! If you are planning for the long term, it is too close. You could always have it moved, but it is better to do this earlier rather then years later. 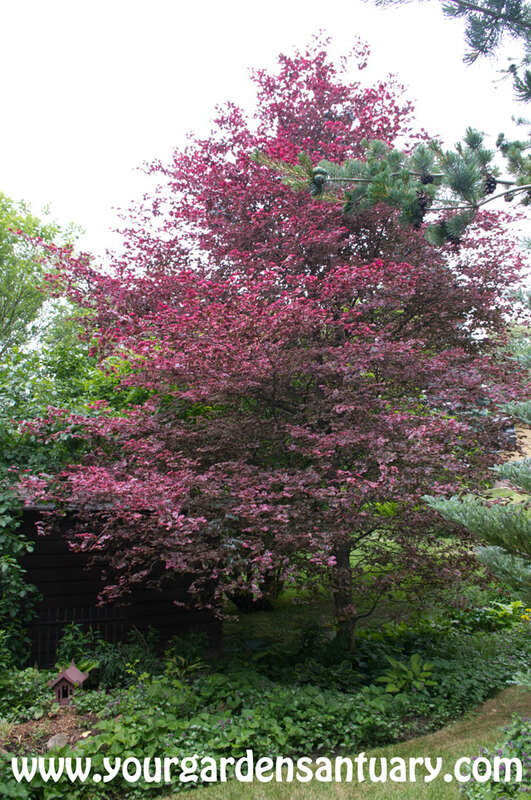 A smaller purple leaf tree like a Japanese maple may be better for a sight that close to the garage. You could also just move it further away. My tricolor beech has developed mottling of the leaves. The tree is about 7 ft tall and was in the yard when I moved 2 yrs back. I live in Boston, MA. It is located in an open area and gets ample sunlight. Any help will be appreciated. It could be any number of things, having an arborist look at it in it’s site is probably the best way to get a correct answer to your question. I am sure my question will be like many others but thought I would ask and see your thoughts as i have had conflicting info on this. I really want a Tricolor Beech and the spot the I am wanting to put it in a front driveways island bed that gets full sun from morn to eve. I live in Ontario (Caledon to be exact) where summers can get hot to 30 to 35 range at times so is it safe to assume this tree will brown and curl even if i water properly? Yep it will burn and be stressed out there. You can do whatever you want, but I personally would try to find a site better suited for it. I have 2 purple European beech trees planted ~ 8 years ago here in PA one is doing great but the other one has completely brown leaves already. Is there any chance it will come back next year? I would give it a chance. I have had them have scorched leafs in late Summer and still survive, although it will stress them and if done every year could send it into decline. For us in the Chicago area, this Summer has been easy on plants with ample moisture and warm but not brutally hot temps. If a beech was having a hard time with these temps, I wouldn’t give it a chance at a good long term life. We have a healthy tricolor beech about five to seven years old. It gets some indirect sun in summer months but is mostly shaded by mature trees which have been trimmed up. Problem: Green, pink and white colors are present but the whole tree does not have the vibrancy you expect. I t is a rather dull green. Is this a nutrition problem??? Probably not, probably just not enough sun light. I live I Windsor Ontario in a townhouse, I want to plat a 2″ tri-Color beech I the back yard. Faces north, soy bean field behind me, so it’s open to some wind. 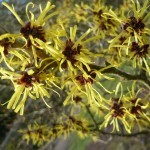 Nurseries won’t give a guarantee this time of year even if they plant it (it’s b&b) . Do I have a good chance it will make it through the winter? If you can’t get a warranty at all, I would say there is your answer. It might survive, but the odds are less then 100%. I would wait till Spring considering it may be a borderline plant in your area as far as hardiness. Thanks for all the info on here regarding tri-color Beech. I live in Southern Oregon and have a tri-color Beech that has been in the ground here for 7 years. It was about 8′ tall when planted, and is now 12.5 foot tall. It gets full sun, so does suffer from leaf burn in July and August from the heat, as well as trunk bark stress on the south side of it from the heat. Last year it produced a large crop of nuts for the first time. This year, not a blossom one. Any idea how often they will produce nuts, or is it just a random event from one year to the next. It was a dry year this year, but the tree is on a drip system that has been set the same each year. I have to plead ignorance, as I don’t know the answer. My guess would be to expect periodic crops of nuts every few years. Please come back and tell me what it does for you next year, as I am curious (although climate can definitely impact this). Jim, I am planning on planting a tri-color beech in an existing bed where I lost a crab two years ago. The bed is between the front walk and the driveway which form a 90 degree angle. It is only about five feet or so from the concrete and my concern is if the shallow root system will possibly crack these surfaces over time or if the tree would not thrive in those conditions. It would get morning sun and indirect sun in the afternoon. The front and opposite sides of the tree roots have tons of open space to spread out. I can plant it a few feet further away if that would make any different. Thanks for help advice. I would move it a few feet to give it some more room. Don’t forget the tree itself will widen out with branches growing low to the ground. Jim – I am considering purchasing a tricolor beech for my side yard. I would like to start with a small tree (2-5 feet in height). I found a company selling one, but the seller said that it is a grafted tree. Do you have any insight why they would have grafted the tree rather than growing it from a seed? Also, do you know if the health, size or length of the tree’s life will be impacted by it being a grafted tree? Thanks for your insight. Don’t worry, every tricolor beech you will find are grafted. Just out of curiosity, why is that? Are tricolor beech trees not able to grow from a seed / beechnut produced by a mature tricolor beech tree? They might grow but they won’t likely resemble their parent. You would probably end up with a green leaf European beech or perhaps a purple leaf one, but the multicolor leaf would likely not be there. I was also wondering is it grafted or not; mine was not looking grafted: perhaps grafted area was hidden under the soil. And I planted it even 2″ deeper, plus 2″ more mulch on top, so that small tiny tri-color branch is under mulch. Is it Ok to have grafted area under soil? “Variegation” happens when leaves do not have enough (or not produce it at all) chlorophyll. If leaves do not produce chlorophyll at all, then of course you can still germinate such plant from seed, but it will eventually die (because leaves do not have chlorophyll responsible for converting light energy into sugars etc.). So that, to save plant (in my experience: cactus) one needs either: graft it on healthy “green” (non-variegated) plant as soon as possible, or 2) put such plant into dark area for few days / weeks, and in most cases it will become “green”. Also, if this tri-color is grafted, I am wondering which one is rootstock, how fast it will grow. For instance, local store here sells absolutely the same kind of cherry, but three different rootstocks: for dwarf, medium, and huge trees. We have got a European Tri color beech from Home depot. It is resting in a 5 gallon pot, roots packed in a jute bag The tallest branch is already 7-8 ft but it shouldn’t be wider than 3 ft. We want to plant it in our front yard which has full sun through out the day. We have found a place but it is near water reader and I guess cable/phone box (green colored) . they are two in number one tall 2-3 ft and other one is big square. Wish I could post a pic for you. I have no clue about the the tree root. My question is, “is it ok to plant tree over there? And what procedure should I follow to plant this tree”. This is a new house in new housing community and we are very new to gardening/landscaping. Thank you for you help and suggestions. I would not plant it in full sun as it really appreciates a bit of shade in the afternoon especially. Dappled sun throughout the day is good too. I would avoid planting right next to utilities. You also mentioned you were new to planting, so don’t forget to call for underground utility locates. In Illinois it is called Julie , in Wisconsin it is called Diggers hotline. It is a free service where the utilities are marked so you don’t damage them when digging. When you plant it, it may need to be staked and it should be mulched and regularly watered this Summer. A good soaking once a week is a good rule of thumb. You can over water. Don’t water every couple of days, let the soil dry out a little bit between. That said most trees die from under watering as opposed to under watering. Thank you for your quick reply. My front yard is south facing, hence sun through out the day. I understand it will be in the favor of the tree to have shade but have no choice since my backyard gets sunlight almost all the day except few areas which is close to the house. I read your previous comments where you suggested it shouldn’t be closer to the house. 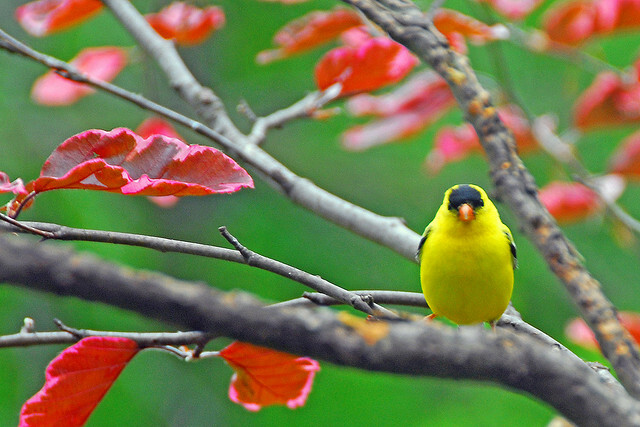 We have two big TCB (10-20 yrs old) in our neighborhood and it is so beautiful and with all pink foliage. That gave me strength to buy one even though we don’t have any shady area. We have called our utility service center and they are coming in next 2-3 days to check and mark before digging. I heard the roots of the tree are shallow. In case utility guy green lit the digging, is it the best idea to plant it over there because of there shallow root system? Also can we grow any flowers around them? Thank you so much for your time. You are my “go to” with questions about my tri color beech. I enjoy reading up on everyone’s questions. I noticed this year my otherwise healthy looking tree seems bare in some spots. Some of the branches only have leaves towards the end of the branch. Is that normal? The tree was planted about 5 years ago, and does get pretty much afternoon sun. (I’m waiting for a nearby Greenspire Linden to hurry up and grow so it gets some shade). So it does brown up in late Summer. I’ve also been treating it yearly for the last 3 years with Bayer Tree and Shrub Care because something was nibbling on the leaves in the past. I still see a little of that this year. Also should I be pruning some of the longer lanky branches back? Any pruning tips would be much appreciated! No that’s not normal, but these trees seem to do odd things some years, so I wouldn’t worry about it yet. Yes you can prune any extra long and lanky branches but you don’t have to it will figure out how to grow. If you do, just tip them back say 6-8″ to a bud pointed in the direction you want it to grow and see how it responds. Patience is a key when growing these beeches. Is a tri-colored beech affected by a black walnut tree and jug lone? I don’t know. I have seen it on lists showing it is tolerant, but not many. I have no experience either way. Anybody out there have an answer for Mike? Found your posting tonight and have enjoyed all of the comments and questions. I have always coveted a Tri Color Beech and had one planted about 6 weeks ago. When I purchased the tree it seemed to be in good shape. The nursery said to water every evening ( sounds like that was wrong) also said my full sun location would be fine, sigh. I noticed tonight that the leaves are fading and seem to becoming crunchy. I am concerned. I have been watering via a drip hose, so haven’t been looking closely until tonight……so perhaps overwatering. I had a older, on it last legs dogwood in the location before. The guy who planted it pulled the stump, put in a fertilizer ( in the hole) the nursery recommended created a larger hole for the new tree then mulched and staked. Don’t water every day that for sure! But do keep up with REGULAR watering. Their leaves will tend to get dried out and “crunchy” as you say in the worst of the Summer heat in Full sun locations. This is especially true for a new plant that is not established at all. Don’t freak out as the tree has gotten most of the sugar from the leaves it will get for the year already. Late season defoliation is not as huge of a deal as early season. I would say expect it to look rough this year, but once it gets established it will look better in subsequent years. I need to prune the lower branches of my tri colored beech from dragging on the ground. They are probably 1 1/2 to 2 inches in diameter. The tree is probably 5 years old. In Indiana can I prune in the Fall and should I paint the cuts with tar after pruning? Thanks! I am not a fan of fall pruning for plants that may be borderline hardy as the area near the pruning cut can be less hardy going into winter if not fully healed. I would wait till the worst of winter is over or till next Spring. There is no benefit or reason to paint the cut. I live in Windsor, Ontario, Canada. I planted a 4 foot, Tri-colour Beech 3 years ago. It is approximently 10 feet now. I noticed in spring that bark at base of tree was peeling off. A nursery suggested spraying the area with tree paint. It is fall now and area that has peeled has expanded to about 1.5 feet long. I cannot see any fungus or disease. Leaves seem to look okay. We had a very hot and dry summer. Any idea on what is happening to it? Here is Southern Oregon the weather get hot in July and august with a typical daily average of 92 degrees and no rain for a few months. Temperatures get over 100 for several days during those months. As a result, the tree here has suffered from trunk bark loss on the south facing side from the intense sun. An Oregon State University Extension Service professional recommended I paint the trunk white to reduce the heat absorption. I have done that. Whether it has helped is hard to tell. I have thought about installing white round split corrugated drain tubing to the trunk to reduce direct sunlight to it, but then I would not be able to inspect the trunk for bugs and such. I’ve recently been introduced to the tricolor beech and live in a newly built suburban community in Northern Virginia- thus I’m anxious to get one in the ground and on it’s long journey to maturity. I’ve basically got one spot I can plant the tree which will, in my opinion, leave it too exposed to direct sun light for most of the day. I did have an arborist check the location and he said it “should be fine.” But I don’t have a lot of faith in his assessment. As I read your blog and other information on the web, I see terms like burned/scorched/fried, but without real concern about the overall health of the tree. Obviously my interest in this tree is for it’s uniqueness and beauty. So my question is, will the “burning/scorching/frying” caused by too much sun light leave me with an eyesore for a tree? Or does the burning just bring about a slight change to it’s overall grandeur? I’m starting to get a little paranoid! Please advise and thanks for your blog- lot of great information. Yes they will look better in a more suitable environment. By mid to late Summer they could look pretty rough. It kind of depends on your climate and the specifics of the site. I had one in full sun and yes it looked kind of bad in Mid August in hot years in Chicago but I still loved that tree. I would say plant one (maybe don’t spend TOO much money on it) and see how it does. I have a new European Tricolor Beach still in the pot. It is about 7 ft. tall and about 1.5 inch diameter. I live in northern Illinois and have read that they should not be planted in the fall. Should I hold off and plant in the spring or is it ok to plant now? Plant now. Maybe don’t dig it out of the ground where you cut 90% of it’s roots off and then plant it, but out of a pot you are fine doing it now. I planted a 6 ft tall tri-color beech tree at the end of September last year. The tree looked is fair shape at that time. We live in Michigan and we got some good amount of rain all these past months. But I am concerned that tomorrow is May 1st and I do not see any leafs showing up. Any suggestions or comments about the tree’s growth cycle will be appreciated. Don’t worry till June. They are among the last trees to leaf out. I appreciate reading all the comments here and it’s helped me understand more how to care for this type of tree. We had one die last summer more than likely due to excessive heat and over watering. It was a hot summer and was planted in late June. A new larger TCB replaced in and was planted in early fall, it has finally leafed out beautifully. I walked over to it today and noticed the leaf tips are already slightly discolored and burnt looking. I haven’t turned our water on yet and we’ve had a pretty soggy spring. It’s in full sun and is planted slightly high so it doesn’t sit in water (landscapers idea) our soil is clayish. I live in Utah and summers tend to get pretty warm and dry. Why would my tree already have scorched tips? I noticed you said deep water 1-2 times per week. We have a drip system (micro sprayer) and usually water for 20 minutes. Is that ok? Hi, Jim – enjoying your blog in general and this discussion in particular! After seeing the photos here, we’ve decided that we need a Roseomarginata. We live in Virginia, zone 7 (actually 6b-ish, but the heat is more likely to be an issue than winter cold). The intended site gets a maximum of 5 1/2 hours of direct sunlight per day in the middle of the summer. Before 10:30 and after 4:00 it is shady and cool – we’re fortunate to have a garden ringed by large trees. There’s a gentle slope that would provide good drainage, though our soil is heavy clay. I’m quite willing to break up the soil and apply an appropriate amount of mulch. Would the tree be happy there, or is this borrowing trouble? It should survive, but will need frequent watering in Summer heat to keep it looking good. Back on an October 21, 2015 post to you I reported on a large crop of nuts for the first time ever with the tree here. You responded: “…expect periodic crops of nuts every few years. Please come back and tell me what it does for you next year, as I am curious (although climate can definitely impact this).” So, this is a follow-up post. No nuts for the last 3 years. A very wet winter and spring this year in Southern Oregon, but a hot summer (above average). I will report back if and when it produces another crop of nuts. We have a tri colored beech which we planted in 1991. We have rarely seen a nut from it. However, this year we were literally covered up with them. My husband just gathered a large wheelbarrow full of them to dump because we couldn’t taste anything in the tiny shiny seed. The chipmunks are eating my tomatoes so I hope they are gathering some of these because I’d had to see them all go to waste. I well recall Beechnut gum but I could only taste a slight hint of it in these nuts. Can you explain why it never had nuts till this year. It is in full sun so maybe that slowed the productivity. This was a mild, pleasant summer in central PA with a just a bit more rain than usual in July and August. I am sorry I don’t have an informed answer on this one. Mine have never produced nuts. Oh, thank you Caroline Leigh! I have read all the posts thus far down and your post is exactly what I was looking for. Ironically, I also live in central PA and my beautiful tree has been growing since 1987. This is the first year we have ever seen nuts, so many on the ground! The reason I am on here is because I didn’t know it could have nuts (since we never had any before) and wanted to find out! Somewhere I read if you plant one of these you should expect people to stop in the street or while walking along, ring your doorbell and ask what kind of tree it is. They DO!!! Some springs are more spectacular than others. It was a splurge back then for $100. It was a lot for us but I have had so much pleasure from it all these years. And I do feel quite proud of the attention it gets when neon pink and breathtaking. Hi Jim! I have loved reading this post and all the comments and your great responses. We just bought a Tri-color Beech tree TODAY from a beautiful nursery in Wilmette, IL. The tree is a birthday gift celebrating the 100th anniversary of our Oak Park, IL home built in 1917. My inquiry is, we have scheduled its planting for Oct 16th and I am hopeful a fall planting is good for the tree. What is the best time of year to plant a Tri-color Beech and what kind of care do we need to give it in its first year in our yard? I believe the nursery said our tree is about an 8-9 year old tree. Hoping you can shed some light on that. No worries though, it is going in a spot where it is shaded by the building from the hot summer afternoon sun. It should do fine. Keeping watering it to the ground freezes but make sure it dries out between watering. This could be anywhere from a couple of times a week to every couple of weeks as we had into winter. Don’t overwater but don’t forget about it either. Last season I purchased a 5′ espalier tri colored beech after selling the house where I planted a one with a beautiful cascading form (sniff). I fell in love with the form of the trunk /branches of this new one. I planted it an exposed section of my new yard as a backdrop to a paved area, waiting for a faster growing tree establish nearby. I don’t think it will happen in time to protect it from afternoon exposure so I want to move it to the opposite end of the patio that is protected from the wind and afternoon sun from a single row of emerald arborvitae 4 feet to the west and a 40 ft maple 30 feet south west of the new location. I’m hoping the espalier form will make it form a double hedge in parallel with the arbs, and if over time it peeps above the abs I’m not worried. I’m not sure if four feet is too close given eastern facing position its espalier form is more lateral (north/south). I’ve read a bit about translating these tree and being careful with the root ball and graft and not to prune it the first two years after transplant. I understand beeches are slow growing and good for hedging, but I haven’t found much about how to prune or manage it in this form. The nursery tied off most shoots to the main lateral branches and it currently has its first late summer shoots of 1-3 inches. I plan to transplant it after late April/early May and would welcome any advice on how to reestablish/form it. I live in SE Michigan. We have a tri birch tree and when we bought it we were told that there was something we could buy that when placed in the soil around it that it would enhance the colour of it. Do you know what that would be? I was walking near our town’s beautiful college campus recently, rounded a corner and this beautiful pink colored tree caught my attention right away. I was surprised to see the green in the leaves when I got closer. After a little searching, I believe what I saw was a tri colored beech (unless there is another tree that looks similar?). I would love to plant a tri colored beech on our property, but wondering if it is messy in any way? I read somewhere about beech trees dropping a nut with a spiky-looking pod, but I’m not sure if that applies to this tree. I dont consider them messy trees. Squirrels often bring some strangely looking nuts into my backyard and hide it in a soil. At first I thought it is peanut in a shell, or maybe chestnut (in a shell), until I noticed germinated trees and saw pictures on Internet: it is beach tree. Perhaps native North American variety, not sure. I tried to dig this small tree but… squirrels ate it already! P.S. Last year I bought at Homedepot Tri-Color one, two of them, both are growing super well. I planted one maybe too deep (at least 4″-6″ deeper than what it was in a pot) and then got scared after reading some articles about “bud union above ground”; last year, two months after planting I tried to uncover it from mulch and noticed a lot of healthy roots right inside mulch (2″ below ground level); probably scion itself started roots. I used Mycorrhizal when planted. Here in Toronto, I was able to see at least 5 different kinds of Beech tree at Eglinton PlantWorld store, and although I like big purely purple leaves more, this “Tri-Color” tree looks amazing as a whole. It’s grafted because it is a cultivar that does not grow that quickly on it’s own roots and because it is a lot quicker to graft them than cultivate them otherwise. It might re-leaf out, might as well wait and see. P.S. I can’t seam to upload pics. of leaves. Some of which are normal size and color tricolor beech leaves. Others are 1”-4” olive green leaves with no tricolor markings. I would like to plant a tricolor in the center of my rose bed. the bed is an oval-shaped, sized about 30’x15′. the bed in my backyard is somewhat raised and contains 10 established “knockout” roses. I live on Cape Cod so the zone is correct. I have some warm afternoon sun, maybe 4 hours, but the lot is well shaded from surrounding dense tree coverage. Should I be concerned with the tricolor becoming too large, thus shading my existing rose bushes? Will I be able to prune the tricolor to keep it somewhat smaller than 20′ wide? Might you have any alternative ideas for a showy tree as a vertical accent in this location? thanks so much in advance! great site! It may eventually shade your roses but you will have years of enjoyment before that. A mature tricolor beech outshines any display of roses in my opinion. I also have roses on perimeter of small garden, and dwarf Japanese maple + big tall birds feeder in centre. About 25 roses around this. And the best idea I found is this: to have fountain in centre (with bench to sit), or to have small gazebo in centre. So you can sit in centre of garden and enjoy roses. I plan to do that. About trees: I planted few behind roses, at “North-East” from roses, so that roses will not be in shade, they will get enough sun. About beech tree: I’ve read somewhere its’ root will suspend anything to grow around. But it will take many years for this to happen; I have 6′ beech trees and I have roses close to it. My tree is looking a bit lanky. Nothing terrible. Some at the bottom are getting rather long. Should tri color Beech trees be pruned? If so, what time of the year? Do you have any tips on how to do it? Sure, European beeches take pruning great. They are even used as hedges. Pruning in Summer should be fine. Just remember it is a slow grower do dont take too much off. We have a tri color beech we planted last September in Indianapolis. It is only about 3 foot tall, but the tree only leafed out at the bottom half and the top half still only has brown buds on it and it is June 2018? Should we cut the top half off? It would look pretty silly, but we don’t know what to do with it. Thanks for any help you can give us. I would leave it for now just in case come dormant buds will emerge later in the season. If nothing emerges by fall, you probably can cut it back. Would love to plant a Tri-Color ‘Roseomarginata’ but have 15 black walnut on the property. American beech will tolerate but will Tri-color? Probably not. An American Beech would be fine, but Tri-Color beech are European beech that are not known to be resistant to juglone (and probably are not). Probably not. As you mentioned American Beech would be fine, but Tri-Color beech are European beech that are not known to be resistant to juglone (and probably are not). I notice green fungus looking stuff on the trunk and branches of my tri color beech. Can you tell me what that is and if it’s harmful to the tree? I have a tri-color that is 9-10 years old. I have never mulched but this year is so hot and dry that I feel the need. Given all the comments on the amount of surface roots; should I dig down a couple of inches and build the mulch from there, or just pile the mulch around the trunk over the grass to avoid damaging the root system. I had a tricolor beech planted this past spring. Its leaves were beautiful but are now not as bright and feel slightly dry. Is it normal for the leaves to change now that we are approaching fall? Also, how quickly does this tree grow? Yes especially if it is getting a bit too much sun (or if your climate is warmer). I planted a Tri-Color Beech tree 4 years ago. It’s about 10 ft tall now. It’s been doing well until recently. We’ve had plenty of rain july through mid august. Since then it has been mostly dry. The tree is partially shaded but now gets a bit of afternoon sun because a tree fell that used to shade it. Starting 2 weeks ago some leaves have turned yellow brown and have fallen off. Now many more leaves have turned yellow brown and fallen. I’m really worried about the tree. Any ideas what could be causing this and what I could do? Thanks. Probably usual considering it has dried out a bit and it has afternoon sun in August. Is it mulched and irrigated at all in August? Thanks for your help. It’s not mulched and the soil is dry. I haven’t watered the tree in about 2 years. Thanks for your help. It’s not mulched and the soil is dry. I haven’t watered the tree in about 2 years. Do you think I will lose the tree? Half of the tree’s leaves have now turned brown. 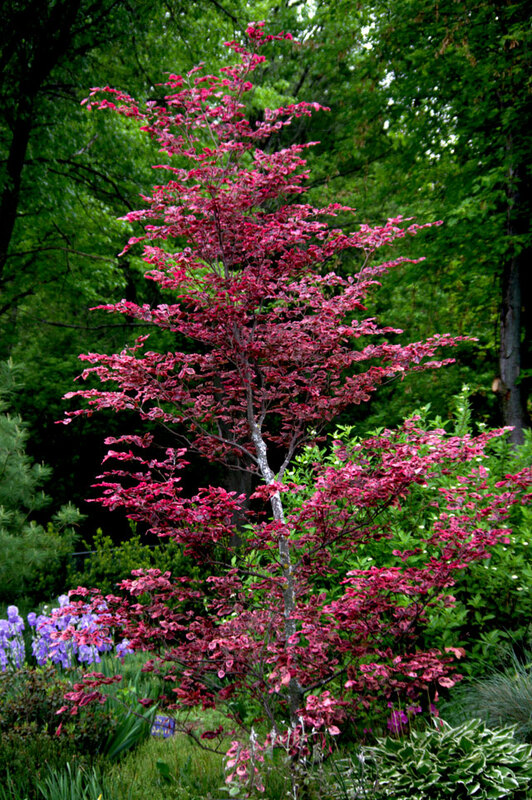 I am thinking of planting a Tri-color Beech amid a large rock garden in our front yard . We live in middle Michigan and the yard has sun pretty much all day . The bed is covered in moderate sized river rock, over very good black soil which is covered with weed fabric. Can the Beech flourish in such a bed? Also, I am thinking of planting a larger shade tree outside the rock garden to give some shade to the yard. I would hope this might help the Beech. It could but it does not sound like a situation I would expect it to thrive in. Hi Jim, I posted previously that the leaves on my Tri Color beech tree were turning brown. They are now all brown. I think it was due to drought. I watered the tree. Do you think my tree will leaf out next spring? Is the soil very wet (i.e. standing water) in winter or spring as the leaves are developing? If so that could be an issue. Otherwise, I would be inclined to think that there is something wrong with the root system such as bad girdling roots. Can you provide the growth rates of the beech trees? I am wanting to plant the European Beach (cooper and purple); the American Beech; and the Tri-Colored cultivar. I am just trying to figure out how much I would get to enjoy these trees given my age, 55. Perhaps I should rephrase. While tomorrow is promised to no one, I am just wondering how big my beech trees will get over 5, 10, 15, 20 years. I live in Northeastern Iowa. They would get plenty of sun, a little shade. I love reading your comments; still have not explored your webpage. European beech will grow about 1′ per year. The American beech will also grow about 1′ per year. The Tricolor will grow less probably closer to 6″. Those are averages of say 10 years. It will be slower until it is established. On some good years, it could be as much as 18″ or more on bigger ones and a foot on the Tricolor. I am looking for seeds of Fagus sylvatica ‘ Purpurea Tricolor . Can you sell me some if you have any? It’s for my home country South Korea. They would not grow true from seed, they need to be grafted on a rootstock from an existing tri-color beech. Hi, I just scratched the bark of the trunk on my Tri Color Beech tree and there is only brown and no green. Does this mean it’s dead? I’m in Washington State and have a tri-colored beech that was planted near the center of my front yard. It’s a gorgeous tree and I really like it … but I’m a bit concerned that it’s going to be too big for the area. It’s far enough way from structures so no worries there … but I don’t want it to overtake everything else. It’s a bit spindly still … and maybe 15 feet tall and 15 feet wide in some places. Love the tree … but need to keep it a bit smaller than I think it’ll eventually get. Do you have pruning advice? Thank you! European beech take pruning amazingly well. They are often even used as hedges in England. This one grows so slow as well that as long as you are willing to have it pruned, I would not be concerned about it over growing your spot. As far as how to prune, I woukd just do reduction cuts on branches that got to large. In response to this recent article on the tricolor beech tree. I contacted you on August 20th 2015 about my mature tri color and how the leaves were turning brown way too early. I had concerns about too much rain that summer and if that might be a problem with the tree. We both thought that I needed to wait till the spring to see what would transpire. The final outcome was a dead tree in the spring! Still don’t have a clue as to what happened to my beautiful tree and I was heartbroken about it dying. It was in the perfect spot, late afternoon sun, well established, always fenced it for deer. Like losing a dear, dear friend. If you ever get to Kalamazoo Michigan you absolutely must visit Bronson park. It has the most majestic, towering tricolor beech tree I’ve ever seen. The trunk is massive, it must be a very, very, very old tree. Before becoming president, Abraham Lincoln gave a speech there and I just wonder if the tree was there at that time? You have to see it Jim! I’d never seen or heard of a tricolor till I visited Bronson park and I fell in love and that’s the reason I purchased mine. I’m not going to get another one. I wish I’d known about this beautiful tree when I was much, much younger. The slow growth of the tree and my age just don’t mix now. Heartbroken in Michigan. Thanks. I am sorry to hear that. Michigan has been a hard state for tree lovers, especially lately. Emerald Ash Borer, Beech Bark Scale and now this. Follow up, I meant to say…..tricolor got late afternoon shade not sun! Anyway, it’s gone! I planted two Tri colored Beeches about a year ago . Now I’m noticing that one of them is tilting to the side a bit while the other is straight up. Either it settled a bit crooked or I failed to plant it straight. If I dug under one of the sides and either lifted and filled under to straighten or dug other side and dropped that side a bit; would that shock the tree too much. It has not started leafing yet here in SW Ohio. ? Also 2nd question is these two Beeches get shade in morning and full sun in afternoon. What are chances they will thrive there?